THE RIVER JANUARY 3, 20146 From page 5Fort Myers Artby 77-foot-long water feature that runs along the west side of the plaza opposite the librarys entrance. The sculpture is on loan to Lee County from the City of Fort Myers under a long-term lease in exchange for which Lee County agreed to install, light and maintain the piece, which has been sealed with three coats of clear Smart Coat sealer to protect it from corrosion and the suns UV rays. The City of Fort Myers has yet to install the four one-by-two-foot life-cast silicon bronze relief panels, which are presently undergoing ADA and historic preservation review. It was important for me to visually mark the historic cattle trail as it made its way from the ranches in eastern Lee County through downtown Fort Myers west toward Punta Rassa where cattle were loaded onto ships destined for Cuba and other ports, noted Mitten. Marking this trail became, for me, a powerful metaphor for passages that mark time, a recurrent theme in my public artworks for more than 20 years. Marks & Brands is the 25th sculpture in the City of Fort Myers public art collection, which also maintains more than two dozen paintings, prints and photographs in its Portable Works Collection. When combined with works commissioned by the federal government, Lee County and other sources, there are more than 45 public artworks within the city limits, with most being concentrated in a four-square-block area in the downtown Fort Myers River District. An arts advocate, Tom Hall guides weekly walking tours of the River Districts public art collection in Fort Myers. For more information, go to truetours.net. TObtntART AND CRAFT bt btSbnfRrJanuary 8-9, 2014 Wed 10-5 Thur 10-4 ARTS CRAFTS FOOD STORES for more info 352-344-0657 or www.tnteventsinc.com Greeters Club January LunchThe Greeters Club will be welcoming the New Year at its first luncheon of 2014, on Thursday, January 16, with song and dance provided by the Calendar Girls, who strive to be role models for women of all ages, showing that age is a state of mind not a number. The group has supported Paws for Patriots since 2006, a program that provides guide dogs to armed forces veterans. Lunch is $20. To make a reservation or find out about membership, email greetersclub@gmail.com with your name, email address and phone number. The luncheons are held on the third Thursday of the month at 11:30 a.m. at the Colonial Country Club, 9181 Independence Way, Fort Myers. Senior Idol ShowThe 10th annual Senior Idol contest is scheduled for 7 p.m. February 21 at Lake Kennedy Center in Cape Coral. Karaoke Jim will be the emcee. All contestants must register prior to the February 20 deadline. Applications are available at the Lake Kennedy Center. Trophies will be awarded for first, second and third places. Contestants must be 50 or over and no paid professionals are alllowed. Entries are limited to the first 15 applicants. Entry fee is $10. Call 574-0575 to register. Lake Kennedy Senior Center is at 400 Santa Barbara Boulevard. Casino Day TripA Big M Casino day trip is planned for February 6 by Lake Kennedy Centers Kennedy Kruisers. The cruise leaves from Fort Myers Beach and features Bingo, slot machines and table games plus and an all-you-can-eat buffet lunch. Preregistration is required. Cost is $25 for members, $30 for non-members. Contact Lake Kennedy Center in Cape Coral at 574-0575. Key West TripLake Kennedy Senior Centers Kennedy Kruisers are taking a trip to Key West on February 14, The Valentines Day cruise starts at Fort Myers Beach aboard the Key West Express. Cost is $148 for members and $153 for non-members. Call 574-0575 to register. Hortoons Valentines LuncheonA Valentines Luncheon will take place on February 13 at Lake Kennedy Senior Center, Cape Coral. Donnie Rush Falknor will performing songs from Marty Robbins, John Denver, Don Ho, Elvis, Charlie Rich, Andy Williams and Ray Price, among others. Cost is $7 per person. Call 574-0575 to reserve a place. THE RIVER JANUARY 3, 201412 Live Shrimp Time And Many Ways To Rig Themby Capt. Matt MitchellAfter catching and using shiners for months, this week they seemed to all but disappear. This always happens around this time of year. Its just usually much earlier when we make this annual switch over to fishing with live shrimp. Having such a warm November and December Im sure is part of the reason the shiners have stuck around so long. Although I will continue to keep looking for shiners for the next few weeks, if I catch them it will be a bonus as now my go-to bait will be live shrimp probably until March. During our winters live shrimp become the main food source of all our game fish. Basically, there is nothing that swims in our waters that will not eat a shrimp. Live shrimp can be fished in a wide variety of methods depending on the situation and species you are targeting. During winter our local bay shrimp are the largest that they get all year and with cooling water temperatures game fish want the bait that is naturally readily available and smaller forage. My shrimp rig for most applications is a twoto three-foot piece of fluorocarbon leader tied with a line-to -line knot to the main line. I then attach to the leader with a loop knot a 1/4oz hook-up jig head with a 2/0 hook. This rig is awesome for fishing deeper creeks, docks, mangroves and even bounced across grass flats for trout. Small chunks of shrimp fished on this same jig head rig is my method of choice for sheepshead fishing too. This jig head rig also gives the shrimp a little larger profile making it look bigger than it really is. Other ways I fish with live shrimp include a popping cork rig out on the flats. For this rig I like to use a jig head about two feet below the float. This keeps the shrimp down in the water column and gives it better action. Cajun Thunderstyle popping corks with a concave top are my choice for this. The concave top makes the loudest noise when popped and the jig head makes the shrimp quickly fall after you pop the float. These rigs work really well and do not tangle up as bad as the old style weighted popping cork. This is probably, day in day out, the best rig to trout fish the flats all winter as it keeps the bait just above the grass and is easy to see visual strike indicator. For shallow water situations I rig free-line with the live shrimp. You can rig this several ways matching the size of the shrimp to the size of the hook, To rig it weedless, use a longer shanked hook and turn the hook back into the shrimp. If you want to keep the bait closer to the bottom simply add a split shot. Free-lined shrimp fished around dock lights at night are hard to beat as this is the most natural presentation possible. For lure fishermen, its time to make the switch too. After fishing shiner and baitfish patterns since last spring, gamefish really have started to key in on shrimp. Soft plastic shrimp jigs bounced across the bottom and DOA Shrimp are becoming the lures of choice. Chunks of shrimp also make a great addition to tip these jigs with. To catch a wide variety of species during our winter months no other bait can compete with a live shrimp. They are easy to get and the ways you can fish them are pretty much limitless.Capt. Matt Mitchell has been fishing local waters since he moved to Sanibel in 1980. He now lives in St. James City and works as a back country fishing guide. If you have comments or questions email captmattmitchell@aol.com. 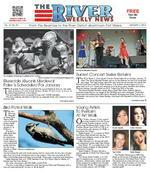 Send Us Your Fish TalesThe River Weekly would like to hear from anglers about their catches. Send us details including tackle, bait and weather conditions, date of catch, species and weight, and include photographs with identification. Drop them at the River Weekly, 1609 Hendry Street, Suite 15, Fort Myers, Florida 33901, or email to press@riverweekly.com. Kat White with a redfish caught on a live shrimp while fishing with Capt. Matt Mitchell ISLAND MARINE SERVICES, INC. NEW MOTOR SALES REBUILT POWERHEADS FACTORY TRAINED MERCURY MARINER JOHNSON EVINRUDE SUZUKI YAMAHA OMC I/O'S MERCRUISERCourteous Professional Marine Repair Service Dockside Service Serving Sanibel & Captiva For Life472-3380 466-3344 Your Bottom Specialist Call on Paint PricesDave Doane NEW MOTOR SALES REBUILT POWERHEA D S FA C T O RY T R A I N E D MER C U RY MARINER JO HN SO N EVINR U D E S UZUKI YAMAHA O M C I/ O S MER C RU I S E R C ourteous Professional Marine Repair S erv i ce D oc k s i d e S erv i ce S ervin g S anibel & C aptiva For Li f e Y B t t Yo ur Botto m Yo ur B ot to m Speciali st Specialist Call on Paint Prices C Call on Paint Prices C C ll on P in tPrices C C i i Call on Paint Prices Da v e D oa n e 1 481 4 7 33 12600 McGregor Blvd, Ft Myer s www. scuba vi ced iv e r s com S wim with t h e Fi s h es BOAT RENTALSFishing Cabbage KeyDolphin Watching Captains Available472-5800Jensens Marina Captiva Island Power Squadron Boating ClassesThe Fort Myers Power Squadron is offering the nationally recognized advanced boating class called Seamanship beginning Wednesday, January 8 from 10 a.m. until noon on successive Wednesdays until February 5 at the squadron building. The cost is $45 and includes two text books. Squadron Commander Vic Stewart will conduct the class. The introductory boating course entitled Americas Boating Course will take place over five consecutive Tuesday evenings, beginning Tuesday, February 4 and concluding Tuesday, March 4. Classes run from 7 to 9 p.m. All course materials will be provided. Light refreshments are complimentary. The cost is $40 for a single participant and $ 60 for a couple. (Most insurance companies offer a significant discount to boat owners who have taken and completed this course.) Registration and payment can be completed upon arrival at the first session. The squadron building is at 3145 Royalton Avenue in Fort Myers, about 1.5 miles east of downtown Fort Myers. Following completion of the class and a short exam, certificates of completion will be issued and paperwork for application for the Florida Boating Education ID Card will be provided. There is no charge for the card but a boating safety course must be completed to qualify. Contact Grant Esser, by E-mail, grantesser@comcast.net, or at 945-6612. Florida law requires all persons under the age of 25 to have taken and passed a boaters safety class when operating a boat with an engine of 10 hp or more on Floridas waters. This age limit will increase by one year on each January 1. THE RIVER JANUARY 3, 201414 Plant SmartTree Lilyby Gerri ReavesTree lilys (Cubanola domingensis) extravagant pendant-like flowers is a rare sight in South Florida. A native to the Dominican Republic, this species belongs to the same family as coffee and the gardenia. It is also known as Dominican bells and Dominica bell flower. The tubular downward-hanging flowers are pale yellowish or greenish white and eightto 10-inches long. They bloom periodically in the warm months and are highly fragrant in the evening. The oval or elliptical leaves are about two to five inches long and oneto twoand a-half inches wide. Tree lily takes the form of a shrub or small tree, usually reaching five to seven feet tall. It needs well-drained soil, filtered light ideally, morning sun with some afternoon shade and plenty of water in the summer. Avoid letting the roots dry out in winter but take care not to over-water it. Tree lily does well as a container plant for a sun room or patio. Propagate it with cuttings. Caution: Parts of the plant are toxic if ingested. Sources: fairchildgarden.org, botanicgarden.ox.ac.uk, rareflora.com, and centerofthewebb.ecrater.com. Plant Smart explores the plant life of South Florida and sustainable landscape practices. Tree lily, native to the Dominican Republic, is a rare plant in South Florida photos by Gerri Reaves Numerous fragrant tubular bell-like flowers bloom in the warmer months Underwater Wonders At Imagine GalaThe Imaginarium Science Center Imagine Gala Underwater Wonders offers adults the chance for a night of play while exploring the incredible world of Floridas waterways through its many exhibits. The gala takes place on Saturday, March 29, at 7 p.m. at The Imaginarium Science Center, 2000 Cranford Avenue in Fort Myers, and calls for cocktail attire. Tickets are $75 when purchased prior to March 22 and $100 after that date. There will be live music, food and drinks, auction items and packages with interactive technology, smartphone-based bidding, and educational displays, all while raising funds for the centers programs and exhibits. Unique to the gala will be collaborative art pieces featuring the heads and faces of local community leaders enhanced by childrens depictions of their bodies. Eric Raddatz, founder of the Naples and Fort Myers film festivals, will be the emcee and auctioneer. Guests will be able to explore new exhibits that the center expects to complete in early 2014. Watershed Wonders: Caloosahatchee Connections is an interactive exhibit that illustrates the Florida watershed from Lake Okeechobee to the Gulf of Mexico through the Caloosahatchee. Phases 3 and 4 of this project are scheduled to be completed in January. The Water Table exhibit, a hydroponic display including plants and fish, is also scheduled to be completed in January. For more information about The Imaginarium Science Center and the Underwater Wonders Gala, call 3217420 or visit www.i-sci.org. Introduction To Using GPS Class sumitted by Cdr. Mary Smelter, The San Carlos Bay Sail & Power SquadronThe San Carlos Bay Sail & Power Squadron, a unit of the United States Power Squadrons, will be offering a class in basic GPS operation on Saturday, January 18 from 1:15 to 4:30 p.m. This class will be offered again in February. The class is designed to introduce new users to GPS. The class will include discussions of marine navigation, how a GPS works, and GPS limitations. There will be an extensive presentation on what a GPS can do and what a boater can do with GPS. For those interested in purchasing a GPS, they will understand what a GPS can do for you along with some of the key features to look for. The cost of the class is $45 per person. The class is being taught at the San Carlos Bay Sail & Power Squadron classroom, located at 16048 San Carlos Blvd at the corner of Kelly Road (across from ACE Hardware). Students can register online at www. scbps.com or call 466-4040. Master Gardener CertificationA 14-week Lee County Extension Master Gardener Certification Training Class will be offered starting January 24. The course, which trains citizens to become master gardener volunteers, covers topics such as soils, fertilizers, pest and disease identification and control, native plants, citrus, lawns and palms. Classes are held from 9 a.m. to 3 p.m. every Friday at the North Fort Myers Recreation Center, 2000 Recreation Parkway in North Fort Myers. The fee is $140. For an application or information, email brownsh@leegov. com, call 533-7513 or visit http:// lee.ifas.ufl.edu/Hort/HortClasses/ MGTrainingClass_2014.pdf. Lee County Extension agents offer educational services through a three-way cooperative arrangement between the Lee County Board of County Commissioners, the University of Florida and the U.S. Department of Agriculture. Local extension agents are off-campus faculty members of the University of Florida and are housed within Lee Countys Parks & Recreation Department. 19 THE RIVER JANUARY 3, 2014 Miller Play To Open January 10 Arthur Millers American masterpiece, Death of a Salesman, will open at The Laboratory Theater of Florida on Friday, January 10. Acknowledged as a milestone in American theater, the play features Willy Loman, an aging, failed salesman with more dreams than any life could realize. He returns home from work exhausted one day to find that his equally unsuccessful sons have come home to visit. The air is thick with tension as secrets come to light and lies are exposed. The New York Times says, By common consent, this is one of the finest dramas in the whole range of the American theater. Death of a Salesman won the Pulitzer Prize and the Tony Award the year it premiered, 1949. It has since won Tony Awards each year it has seen a New York City revival. Its latest win, in 2012, was for the Philip Seymour Hoffman production, directed by Mike Nichols. The Laboratory Theater production stars Mitch Haley as the iconic salesman, Willy Loman. Haley has acted in Im Not Rappaport for the Florida Repertory Theatre, Lysistrata for Theatre Conspiracy, Picnic for Cultural Park Theatre, and Women Beware Women for The Laboratory Theater of Florida, to name a few. Joann Haley supports as Linda Loman and boasts an equally impressive resume. Also supporting are Rob Green as Biff, the disappointed son, and Stu Colon as other son, Happy. The cast is rounded out by Rick Sebastian as next-door neighbor Charley, Bill Molesky as Ben, the fantasy older brother who only exists in Willys mind, as well as actors Mary Powell, Jeffrey Schmitt, David Jennings, Caitlynn Crawford, Ken Bryant and Taylor Adair Nave. Its a very honored play, very decorated, and for obvious reasons, says director Louise Wigglesworth. The cast is strong and experienced and the more we work, the more we discover. Says assistant director Nykkie Rizley, Death of a Salesman is relevant today because we are still striving for the American dream and constantly reassessing what that dream is. Willy Loman and his sons are deeply flawed characters and Linda Loman enables all of them. These are parents who are teaching their sons that they dont have to work for anything, that they are already great. Its totally unrealistic and a serious disservice to the kids. Its their tragedy. Doors open at 7:15 p.m. for the opening night reception. Other performances are on January 11, 16, 17, 18, 23, 24, 25, 26, 30, 31, Feb 1. Tickets are $12 for students, $18.50 for seniors and military on Thursdays, and $22 for adults. They are available for purchase at the door or at laboratorytheaterflorida.com. There will be an audience talk-back after the Sunday, January 26 performance. All guests are welcomed to participate. For more information, call 218-0481. The theater is located at 1634 Woodford Ave. Fort Myers. A scene from Death of a Salesman Actors Mitch Haley and Joann Haley Bluegrass Returns To The Foulds Theatre On SundayThe Acoustic Music Society of Southwest Florida presents three hours of live bluegrass in the Foulds Theatre at the Alliance for the Arts on Sunday, January 5 from 2 to 5 p.m. The concert features three bluegrass bands; Southwind, Larry Wilson and Thunder Mountain Railroad, and Swinging Bridge. The Sunday afternoon concert series continues on February 2. Tickets are $7 at the door, or $5 for Alliance members. Seating is open and first come, first served. Children 12 and under are free if accompanied by an adult. Doors open at 1:30 p.m. Visit ArtInLee.org or call 239-939-2787 for more information. The Alliance for the Arts is at 10091 McGregor Boulevard just south of Colonial Boulevard in Fort Myers. Larry Wilson And Thunder Mountain Railroad Community Band In ConcertThe Lee County Community Band will begin the new year with a concert on January 12 featuring the Sound of Music, Gershwin Classics, Leroy Andersons The Typewriter, and the famous Radetzky March. The concert will take place at 3 p.m. at Cape Coral High School, 2300 Santa Barbara Boulevard, just north of Veterans Parkway.Composed by Johann Strauss in 1848, the Radetzky March was dedicated to Austrian Field Marshall Joseph Radetzky von Radetz in celebration of his victory at the Battle of Custoza during the First Italian War of Independence. When it was first played in front of Austrian military officers, they began clapping and stamping their feet when they heard the chorus, a tradition that remains alive today in Viennas classical music halls. The program also includes the Bergsteiger (Mountaineering) Polka, featuring euphonium soloists Jim Walker, Carol Ploof, and Bob Day in traditional German folk dress. Additional Lee County Band concerts are set for February 9, March 9 and April 6. The events are free (donations accepted) and open to the public. The director is Richard Bradstreet and emcee and vocalist is Normal Jones. The 60-member band rehearses Thursdays from 7 to 9 p.m. at St. Michael Lutheran School, Fort Myers. Members are musicians from all walks of life career musicians, amateurs, and folks renewing skills from years past who reside in Lee, Collier and Charlotte counties. The band welcomes new members every year. For more information, visit www. leecountyband.org or phone Norman Jones at 995-2097. Fort Myers Beach Art Association To Hold Open HouseAn Open House will be held at the Fort Myers Beach Art Association on Friday, January 3 from 9 a.m. until noon. Come visit with the artist, learn more about the group and see the Creative Expressions Display of additional forms of art done by members. Refreshments will be served and guests are welcome. There is no charge to attend. Guests will be able to talk to artists from each of the special painting groups, including outdoor (plein air) painters, indoor painters, experimentalists, and portrait and figure painters. Information on workshops, classes, special short workshops given by members and all the art association events will be available. The FMBAA working gallery is located on Donora and Shellmound in Fort Myers Beach and is open from 10 a.m. to 3 p.m. Monday to Saturday and from noon to 3 p.m. on Sunday. For more information on shows or classes, call 463-3909 or visit www.fortmyersbeachart.com. THE RIVER JANUARY 3, 201424 Players collect teddy bears tossed on the ice photos courtesy of Al Larspon Photo Results of the December 7 Teddy Bear Toss Members of the Everblades delivered stuffed animals on December 18 Delivering stuffed animals at Golisano Childrens Hospital of Southwest Florida One of the Florida Everbabes collects teddy bears Over 6,100 Teddy Bears Collected At Germain ArenaIBERIABANK partnered with Germain Arena and the Florida Everblades on December 7 to host the annual Teddy Bear Toss. Over 6,100 stuffed animals were collected for the Golisano Childrens Hospital of Southwest Florida, Toys For Tots and several other local charities. IBERIABANK also donated 126 tickets to the event for patients, families and medical staff from the hospital to enjoy the hockey game. Bill Valenti, market president for IBERIABANK, and players from the Everblades delivered the toys to children at the hospital on December 18. This was such a heart-warming experience. The kids were smiling ear to ear as were all the adults, said Valenti. We are fortunate to live in a community where people are so generous and willing to help others. The spirit of giving is alive and well in Southwest Florida. DID YOU KNOW My Stars FOR WEEK OF JANUARY 6, 2014ARIES (March 21 to April 19) Its a good time to take a much-needed break from your recent hectic schedule and spend some time in quieter surroundings. Important news could arrive early next week. TAURUS (April 20 to May 20) The Taurean traits of reliability and thoroughness could be well-tested when decision-makers consider your proposals and/or requests. Be prepared to answer some probing questions. GEMINI (May 21 to June 20) A sudden attack of boredom leaves you with some tasks undone. Its OK to take a short respite. But get back to work by weeks end so that you have time for other projects. CANCER (June 21 to July 22) Avoid prejudging a situation just because it looks bad. Facts could emerge that would make your position uncomfortable, to say the least. A relative has interesting news to share with you. LEO (July 23 to August 22) This is a good time to begin reassessing some of your recent decisions about your long-range goals to see if they still have merit. Spend more time with loved ones this weekend. VIRGO (August 23 to September 22) An unsettled situation at home or on the job early in the week could drain your energy levels, making it difficult to get your work done on schedule. But things improve by midweek. LIBRA (September 23 to October 22) A temporary setback could give you time to go over your plans to find weaknesses you might have overlooked before. A romantic getaway with that special person is favored this weekend. SCORPIO (October 23 to November 21) Professional and personal situations benefit once you set a positive tone in getting things off to a good start. Honest dialogue smoothes over any occasional display of balkiness. SAGITTARIUS (November 22 to December 21) A problem with workplace colleagues or family members seems to defy even your sage counsel. But be patient. Your words eventually will lead to a resolution. CAPRICORN (December 22 to January 19) Dont just wait out that unexpected and unexplained delay in your career move. You could gain added respect if you ask why it happened and what you can do to move things along. AQUARIUS (January 20 to February 18) Although your workplace strategies usually are accepted, you could be challenged by someone who isnt so favorably impressed. Be prepared to defend your positions. PISCES (February 19 to March 20) Your friendship circle expands, with new people coming into your life at this time. Welcome them warmly. But dont neglect those cherished longtime personal relationships. BORN THIS WEEK: You love to search for knowledge and share it with others. You would make an especially fine teacher. On Jan. 9, 1776, writer Thomas Paine publishes his pamphlet Common Sense, setting forth his arguments in favor of American independence. Originally published anonymously, Common Sense is considered one of the most influential pamphlets in American history. On Jan. 8, 1916, Rembrandt Bugatti, a sculptor and younger brother of Italian auto designer and manufacturer Ettore Bugatti, commits suicide at the age of 31. Bugattis sculpture of a dancing elephant was featured as a hood ornament on a 1920s Bugatti Royale auto. On Jan. 12, 1926, the two-man radio comedy series Sam n Henry (later named Amos n Andy) debuts in Chicago. Freeman Gosden and Charles Carrell, both white, played characters who were two black men from the Deep South. Over the next 22 years, the show would become the highestrated comedy in radio history. On Jan. 11, 1935, American aviator Amelia Earhart departs Wheeler Field in Honolulu on a solo flight to North America. Hawaiian commercial interests offered a $10,000 award to whoever accomplished the flight first. The next day, after traveling 2,400 miles in 18 hours, Earhart safely landed at Oakland Airport in Oakland, Calif. On Jan. 7, 1959, just six days after the fall of the Fulgencio Batista dictatorship in Cuba, U.S. officials recognize the new provisional government of the island nation. Despite fears that Fidel Castro might have communist leanings, the U.S. government believed that it could work with the new regime. On Jan. 10, 1961, Dashiell Hammett, author of The Maltese Falcon, dies. Hammett left school at age 13, eventually landing at Pinkertons detective agency. He worked as a detective for eight years and turned his experiences into hard-boiled crime fiction. On Jan. 6, 1975, a crowd of 2,000-plus lines up outside Boston Garden to buy tickets to the rock band Led Zeppelin. Someone pried open the Gardens locked doors around midnight, and soon hundreds of beer-drinking, bottle-throwing Led Zeppelin fans had the run of the arena. It was noted wit Ambrose Bierce who defined an egotist as a person more interested in himself than in me. If you could go back in time and sample a beer from the 1700s, you would find it to be significantly stronger than similar libations that are served today. The higher alcohol content helped the brew survive the long voyage from England to colonial India. Those who study such things say that roughly half of American women remove hair from their bikini area. Perhaps unsurprisingly, as women age, they become less likely to keep up the shaving or waxing, with only 19 percent of women aged 50-plus doing so. In Brazil, though, the practice is far more widespread; there, 65 percent of women in the 50-plus age group reported bikini hair removal. The average horse will produce 10 gallons of saliva every day. Historians claim that President John Quincy Adams kept a pet alligator in a White House bathroom. He reportedly was amused when unsuspecting guests had to make a trip to the loo. I wouldnt be surprised if youve never heard the word pilgarlic -its not a term you hear every day. Its literal meaning is peeled garlic, but colloquially it was once used to describe a bald-headed person. In the U.S. in 1900, imported perfume was taxed at a higher rate than imported opium. If you are planning a trip to Hawaii, you might want to go to the Sea Life Park on Oahu. There you can see a rare creature: the wolphin. This cross between a killer whale and a bottle-nosed dolphin also reportedly exists in the wild, but I imagine theyre a bit more difficult to find. In any contest between power and patience, bet on patience. -W.B. Prescott THIS WEEK IN HISTORY STRANGE BUT TRUE THOUGHT FOR THE DAY PUZZLE ANSWERS 1. GEOGRAPHY: In what U.S. state is Salt Lake City located? 2. HISTORY: Where did abolitionist John Browns famous raid take place in 1859? 3. ENTERTAINERS: Which stand-up comedian, who starred in the movie Back to School, was born with the name Jacob Cohen? 4. ANATOMY: What is the most common type of blood? 5. MOVIES: Anne of the Thousand Days is a film about which historical couple? 6. GAMES: What early version of a video game mesmerized TV viewers in the mid1970s? 7. RELIGION: What are the first four books of the Bibles New Testament, in order? 8. COMICS: What is Catberts title in the Dilbert comic strip? 9. BUSINESS: What popular business did Judy Sheppard Missett create? 10. TELEVISION: What was Rays last name in the series Everybody Loves Raymond? TRIVIA TEST 1. Utah 2. Harpers Ferry, (West) Virginia 3. Rodney Dangerfield 4. O positive 5. Anne Boleyn and King Henry VIII 6. Pong 7. Matthew, Mark, Luke and John 8. Evil Director of Human Resources 9. Jazzercise 10. Barone. ANSWERS25 THE RIVER JANUARY 3, 2014 SPORTS QUIZ 1. Name the last brothers before Atlantas B.J. and Justin Upton in 2013 to hit back-to-back homers in a major-league game. 2. Who holds the major-league record for most career major-league pinch-hit home runs? 3. In 2012, the New England Patriots ended a record run for most consecutive games played without their won-loss mark falling below .500. How many was it? 4. How many consecutive seasons has Gonzaga mens basketball coach Mark Few notched at least 20 wins? 5. Who was the Washington Capitals career points leader entering the 2013-14 NHL season? 6. How many CONCACAF Gold Cup soccer tournaments has the U.S. mens soccer team won? 7. Name the last filly to win the Kentucky Derby, and the year it was done. ANSWERS 1. Pittsburghs Lloyd and Paul Waner, in 1938. 2. Matt Stairs had 23 pinch-hit homers between 1992 and 2011. 3. It was 145 games. 4. Fourteen seasons, entering the 2013-14 campaign. 5. Peter Bondra, with 825 points. 6. Five (1991, 2002, and ). 7. Winning Colors, in 1988.